Since Naples was the capital of the Kingdom of Naples, its cuisine took much from the culinary traditions of all the Campania region, reaching a balance between dishes based on rural ingredients (pasta, vegetables, cheese) and seafood dishes (fish, crustaceans, mollusks). A vast variety of recipes is influenced by the local aristocratic cuisine, such as timballo and the sartù di riso [it], pasta or rice dishes with very elaborate preparation, and dishes from popular traditions prepared with inexpensive but nutritionally healthy ingredients, like pasta e fagioli (pasta with beans) and other pasta dishes with vegetables. Naples has a history that goes back many centuries: the city itself predates many others in that area of the world, including Rome. It has endured the Greeks, Romans, the Goths, the Byzantines, and dozens of successions of kings from France and Spain. Each culture left a mark on the way food is prepared in Naples and Campania itself. Finding the connections between modern and Greco-Roman culinary traditions is not always easy. Among the traces of classical culinary tastes, plates from the period of Greek rule found in Magna Graecia (southern Italy) depict fishes and mollusks, an indication that seafood was appreciated during that period. Frescoes from Pompeii depict fruit baskets filled with (figs and pomegranates). An excavation at Oplontis in the Villa Poppaea shows a fresco of a cake, the ingredients of which are not yet known. Lithography from an original drawing by Teodoro Duclère (1816–1869), titled"Il tavernaio"
The Roman garum is the ancient sauce most similar to that used for the modern Colatura di Alici, typical of Cetara. It can be traced back to the sweet-sour taste typical of the Roman cooking described by Apicius, along with the use of raisins in salty dishes, like the pizza di scarola (endive pie), or the braciole al ragù (meat rolls in ragù sauce). The use of wheat in the modern pastiera cake, typical of Easter, could have had originally a symbolic meaning, related to cults of Artemis, Cybele and Ceres and pagan rituals of fertility, celebrated around the Spring equinox. The name struffoli, a Christmas cake, comes from the Greek word στρόγγυλος (stróngylos, meaning "round-shaped"). The Spanish and French sovereignty in Naples initiated the difference between the cuisine of the aristocrats and that of the poorer classes. The former was characterized by elaborate, more cosmopolitan, dishes, and a greater number of expensive ingredients, including meat. The poor used foods that were cheaper and could be grown locally (that is, cereals and vegetables). These were embellished over the centuries and came into contact with the influence of the aristocratic cuisine, so that today traditional recipes of the poorer classes have often acquired great quality and taste, while preserving the original simple ingredients. One of the most famous chefs from the nobles' courts in Naples was Vincenzo Corrado [it]. The nutritional value of the napolitan cuisine was discovered by the American epidemiologist Ancel Keys in the 1950, being later often mentioned by epidemiologists as one of the best examples of the Mediterranean diet. There is a great variety of Neapolitan pastas. Pasta was not invented in Naples, but one of the best grades available is found quite close by, in Gragnano, a few kilometers from the capital. It was here also that the industrial production of pasta started, with the techniques to dry and preserve it. The main ingredient is durum wheat, harder to manipulate than soft wheat, so the industrial production had greater success than in northern Italy, where home-made pasta is more popular. Traditionally in Naples pasta must be cooked "al dente", while soft pasta is not tolerated. The most popular variety of pasta, besides the classic spaghetti and linguine, are the paccheri and the ziti, long pipe-shaped pasta, broken by hand before cooking and usually topped with Neapolitan ragù. Pasta with vegetables is usually also prepared with pasta mista (pasta ammescata in Neapolitan language), which is now produced industrially as a distinct variety of pasta, but which was once sold cheaply, made up of broken pieces of different kinds of pasta. Tomatoes entered the Neapolitan cuisine during the 18th century. The industry of preserving tomatoes originated in 19th-century Naples, resulting in the export to all parts of the world of the famous "pelati" (peeled tomatoes) and the "concentrato" (tomato paste). There are traditionally several ways of preparing home-made tomato preserves, either bottled tomato juice, or chopped into pieces. The famous "conserva" (sun dried concentrated juice) tomato is cooked for a long time and becomes a dark red cream with a velvety texture. Some of Campanian dishes using vegetables, like the parmigiana di melanzane (aubergine pie) or peperoni ripieni (stuffed peppers) can become real stars of the table. Some of the most typical products are friarielli (a local variety of Brassica rapa), Cichorium endivia, smooth or curly (two varieties of endive), several types of broccoli, verza (Savoy cabbage, a variety of Brassica oleracea sabauda [it]) and others, used to prepare the minestra maritata. Different types of beans, chickpeas and other legumes are very popular. Zucchini are widely used; the largest ones are fried with vinegar and fresh mint (a scapece). The male flowers of zucchini can be fried in a salty dough (sciurilli [it]). Salad is a side dish of many dishes, especially seafood ones. Lettuce, and more often the incappucciata (a local variety of the iceberg lettuce), more crispy, is mixed with carrots, fennel, rucola (some time ago it spontaneously grew in landfields, and was sold in the streets together with the less noble pucchiacchella), radishes, traditionally the long and spicy ones, which today are more and more rare, almost completely replaced by the round and sweeter ones. During the Second World War, it was not rare, in the poorest families, to use less appealing ingredients. Recipes have been reported of pasta cooked with empty pods of fava beans or peas. the ricotta di fuscella [it], very fresh and light, was originally sold in hand-made baskets. Commonly found now as a filling for certain pastas. 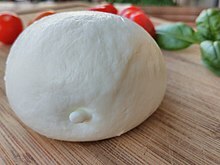 the mozzarella di bufala, fresh cheese made with buffalo's milk, produced mostly on the region of Aversa and in the plain of Sele river. Most cephalopods are employed (octopus, squid, cuttlefish), as well as crustacea (mainly shrimp). Shellfish cozze (mussels), vongole (clams), cannolicchi (Ensis siliqua, taratufi, telline (Donax trunculus), sconcigli (Haustellum brandaris)) are employed in many seafood meals, and sometimes are eaten raw, but this happens more and more seldom nowadays. Clams require a special note. The vongola verace is Venerupis decussata, not to be confused with the Philippines clam (Venerupis philippinarum), very frequently found on the markets, and often called verace in northern Italy's markets), and the lupino (Dosinia exoleta). It is now forbidden by law to sell and eat the sea dates (datteri di mare, Lithophaga lithophaga), as their fishing seriously damages coastline rocks, mainly in the Sorrento peninsula. trippa (tripe) and other more humble cuts of pork or beef, like the typical 'O pere e 'o musso [it] (pork's foot and cow's nose), and the zuppa di soffritto [it], a spicy soup with tomato and hot chili pepper. Carlo Brogi (1850-1925) - "Naples - Maccheroni shop"
The most popular bread is pane cafone prepared with natural yeast, cooked in a wood-fired oven with hard crust and large holes inside. Also used are sfilatini, somewhat similar to a French baguette, but shorter and thicker. Rosetta rolls and other varieties are also present. From the classic "pummarola" (tomato sauce) to the simplest aglio e uoglio (garlic and oil), down to a wide variety of sauces, with vegetables or seafood, up to the ragù, southern Italy's creativity enhances its pasta dishes. Cuisine traditionally attributed to the poor often mixes pasta with legumes. The most popular are: pasta e fagioli (pasta with beans), sometimes enriched with pork rind (cotiche), pasta e ceci (pasta with chickpeas), pasta e lenticchie (pasta with lentils), pasta e piselli (pasta with peas). Nowadays cicerchie (Lathyrus sativus) have become very rare. Similarly to legumes, other vegetables are associated with pasta, like pasta e patate (pasta with potatoes), pasta e cavolfiore (pasta with cauliflower), pasta e zucca (pasta with pumpkin). The most traditional cooking method consists in cooking the condiments first, for instance, pan fry garlic with oil, then add steamed beans, or fry onion and celery, then add potatoes cut into little dices; then, after frying, water is added, brought to boiling temperature, salted, and pasta is added and stirred frequently. While cooking with all the other ingredients, pasta does not lose its starch, which would have been lost if cooked separately in salty water and then drained. Cooking pasta together with vegetables makes the sauce creamier ("azzeccato"), and is a way of preparing pasta distinct from the tradition of "noble" cuisine, which prepares similar dishes in a way more similar to broth or soups, adding pasta after cooking it separately. One more hearty dish in the cuisine of the poor is pasta simply cooked with cheese and eggs stracciatella (pasta caso e ova). Spaghetti, dressed with tomato sauce, black olives from Gaeta and capers are called spaghetti alla puttanesca. An imaginative recipe was created on the tables of the poor, where the expensive shellfishes were missing: spaghetti, dressed with cherry tomatoes sauce, garlic, oil and parsley are called spaghetti alle vongole fujute (spaghetti with escaped clams), where clams are present only in the imagination of the people eating the dish. The frittata can be prepared with pasta leftovers, either with tomato sauce or white. Pasta, cooked al dente is mixed with raw scrambled egg and cheese, then pan fried. It can be enriched with many different ingredients. Must be cooked on both sides, flipped with the help of a plate. If well cooked, it is compact, and can be cut into slices. It can be eaten during outdoor lunches. The aristocratic cuisine used pasta for elaborate recipes, like the timballi, rarely used in everyday food. With the Neapolitan ragù the most traditionally used pasta are the ziti, long macaroni, that are broken into shorter pieces by hand before cooking. The Neapolitan ragù is also used, together with fiordilatte, to dress the gnocchi alla sorrentina [it], then cooked in oven in a small single-portion clay pot (pignatiello). There are many more varieties, for instance spaghetti with a white sauce of mediterranean cod. Sometimes the traditional dishes of pasta with legumes can be mixed with seafood, so there are, for instance, pasta e fagioli con le cozze (pasta with beans and mussels), or other more modern variations, like pasta with zucchine and clams, that lose any traditional connotation. The most famous rice dish is the sartù di riso, a sort of timballo made with rice, stuffed with chicken livers, sausage, little meatballs, fior di latte or provola, peas, mushrooms, and with Neapolitan ragù, or, in the white version ("in bianco") with béchamel sauce. In the cuisine of the poor, rice is also cooked as riso e verza (rice with cabbage), flavored with little pieces of parmigiano-reggiano cheese crusts, that slightly melt while cooking. A seafood rice dish is the risotto alla pescatora ("Fisherman's risotto"), prepared with various mollusks (different types of clams, squids, cuttlefishes), shrimps and a broth made from the boiling of seafood shells. The Arancini (palle 'e riso), more typical of Sicilian cuisine, are also frequently used in Naples. Pizza is the most popular and best known creation of all Neapolitan cuisine. It soon became very popular among the people as well as barons or princes: it was present in the Bourbon court. King Ferdinand I experienced cooking pizza in Capodimonte's porcelain ovens. After Italian unification, the new kings were also attracted by this southern food. The pizzaiolo Raffaele Esposito created in 1889, in honour to queen Margherita of Savoy a nationalistic pizza, where the colours of the Italian flag were represented by the mozzarella (white), tomato (red) and basil (green). 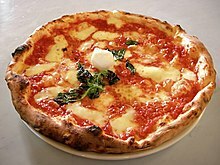 Since then this pizza is called the pizza Margherita. Pizza can be cheap and nutritious, so it had great success very quickly. Sometimes pizza is made in home ovens, but the real Neapolitan pizza must be cooked in a wood-fired oven, hand-made by an able pizzaiolo who makes the dough disk thinner in the centre and thicker in the outer part; the ingredients and olive oil are rapidly spread on the disk, and with a quick movement the pizza is put on the shovel and then slid in the oven where it is turned around a few times for uniform cooking. One of the most famous main courses is a seafood dish recipe coming from the quarter 'Santa Lucia': polpi alla luciana, octopus cooked with chili pepper and tomato. Octopus is also simply steamed, and prepared as salad with lemon juice, parsley and green olives. A richer seafood salad can be prepared also mixing squid, cuttlefish and prawns. Medium size fishes are cooked all'acqua pazza, with tomato, garlic and parsley; the larger ones are simply grilled, accompanied, in the most important meals, with king size prawns. Mussels are prepared in different ways: rapidly steamed with black pepper (all'impepata), and dressed with a few drops of lemon juice each; also cooked al gratin. Clams and other shellfishes are also cooked sauté, rapidly passed in a large pan with olive oil, garlic, and served on crust breads. Cicenielli, the tiny baby fishes, are either steamed and dressed with oil and lemon, or deep-fried in a light dough, which is also used to deep-fry little pieces of some sea algae. The frittura di paranza (deep-fried fishes) is usually done with small-sized local fishes, like cod, goatfish, anchovies and others. It should be eaten very hot, right after being fried (frijenno magnanno). Baby shrimps, sold alive, are fried with no flour, unlike the paranza. The melanzane a barchetta, aubergines cut in half, the center scooped out and filled with different types of stuffing. Fried fish was already mentioned above in the text; many vegetables are deep-fried with flour and egg (dorate e fritte): artichoke, zucchini, cauliflower. The richest version add pieces of liver, ricotta and, in the past, cow's brain. Mozzarella can be prepared dorata e fritta as well and also in carrozza, passed in flour and egg together with two bread slices softened in milk, to form a small sandwich. Typical Neapolitan fried food are also the crocchè, stuffed potato balls passed in breadcrumbs and deep fried, or also the Sciurilli [it], zucchini's male flowers fried in a dough, that can also be bought on the streets of Naples historical center in typical fried food shops, called friggitoria, together with scagliozzi [it] (fried slices of polenta), pastacresciute [it] (fried bread dough balls) and aubergine slices. Onions, fried up to a golden color, are the base for the famous frittata di cipolle (onion omelette). sfogliatella, in two varieties: frolla (smooth) or riccia (curly). Two variation are the santa Rosa, larger and with an additional stuffing of cream and black cherry, and the coda d'aragosta (lobster tail), with a bignè inside and stuffed with various types of cream. Ice creams are famous as well. The most traditional are the coviglie [it] and the spumoni. Christmas Eve dinner is usually the time when all family members join. It is typically done with spaghetti alle vongole followed by capitone fritto and baccalà fritto (deep fried eel and stockfish); as a side-dish there is the Insalata di rinforzo [it], a salad made with steamed cauliflower, giardiniera, spicy and sweet peppers (pupaccelle), olives and anchovies, all dressed with oil and vinegar. Christmas Eve dinner is completed with the ciociole, which are dried fruits (walnuts, hazelnuts and almonds), dried figs and the castagne del prete, baked chestnuts. Christmas lunch has typically the minestra maritata or hand-made pasta with chicken broth. The main Easter dishes are the Casatiello [it] or tortano, a salty pie made with bread dough stuffed with various types of salami and cheese, also used the day after Easter for outdoor lunches. Typical of Easter lunches and dinners is the fellata, a banquet of salami and capocollo and salty ricotta. Typical dishes are also lamb or goat baked with potatoes and peas. Easter cake is the pastiera. Carnival has the Neapolitan version of lasagna, that has no béchamel sauce, unlike other Italian versions. As dessert, there is the Sanguinaccio dolce with savoiardi biscuits, or also the chiacchiere, diffused all over Italy with different names. 2 November (All Souls Day) cake is the torrone dei morti, which, unlike the usual torrone is not made with honey and almonds, but with cocoa and a variety of suffings, like hazelnuts, dried and candy fruits or also coffee and more. Fruit is often present at the end of a meal. Local production is abundant, one of the most popular local products is the annurca apple, a local type of apple whose origins are old indeed: it is believed to have first been planted by the Romans. Slices of watermelon ( 'o mellone) were in old times sold in little street shops (mellunari), nowadays disappeared. The sweet and tasty yellow peach ('o percuoco c' 'o pizzo, in Neapolitan) is also sometimes used, chopped in pieces to add flavor to red wine coming from Monte di Procida, cold and somewhat similar to Spanish sangria. Many wines from Campania match very well to the local cuisine. Among white wines the most famous are Greco di Tufo, Falanghina, Fiano di Avellino and Asprinio di Aversa, while the most famous red wines are Aglianico, Taurasi DOCG, Campi Flegrei Piedirosso [it] also known as pere 'e palummo, Solopaca, Lacryma Christi from Vesuvius, that is produced both white and red. The most abundant lunches or dinners end with coffee and liqueur. Limoncello is now world-famous, but once upon a time the most preferred one was the liquore ai quattro frutti, with lemon, orange, tangerine e limo (not to be confused with lime), which is a local variation of bergamot orange, now very rare. Nocillo is also very popular all over Italy, and is the most appreciated bitter liqueur. In Naples, the use of buying and eating food in the streets dates to very ancient times. The origins probably date back to Roman thermopolia or maybe earlier. Typical fried food can still today be bought in little shops, like Pastacresciute [it] (deep fried bread dough balls), Scagliozzi [it] (deep fried polenta slices) and sciurilli [it] (deep fried male zucchini flowers), or deep fried aubergines. Pizza is also prepared in small sizes to be eaten in the street, the so-called pizza a libretto, still found in Naples pizzerias in via dei Tribunali, port'Alba and piazza Cavour. In via Pignasecca, in the historical center, there are still some carnacuttari shops, selling various types of tripe, 'O pere e 'o musso [it] (pork's foot and cow's nose) or the old zuppa 'e carnacotta (tripe soup). From Mergellina to via Caracciolo there are still several little shops selling taralli nzogna e pepe (salty biscuits with pork's fat and black pepper). Nowadays the old typical 'o broro 'e purpo (octopus broth) has become extremely rare to find. A few decades ago, street shops sold 'o spassatiempo, a mix of baked hazelnuts, pumpkin seeds, toasted chickpeas and lupins under brine. Frijenno magnanno, Salvatore di Fraia Editore, Pozzuoli (NA): Contains a large variety of recipes and creative neapolitan dishes. Vincenzo Corrado, Il cuoco galante, in Napoletan language, III edition, 1786, editby Forni, Sala Bolognese (BO), 1990. Vincenzo Corrado, Pranzi giornalieri variati ed imbanditi in 672 vivande secondo i prodotti della stagione, in Napoletan language, III edition, 1832, re-edit by Grimaldi, Naples, 2001. ^ See Frijenno Magnanno in the bibliography. ^ Roger Hudson, ed. The Grand Tour 1993:189. ^ Galiani to Bernardo Tanucci, 1759, quoted in Francis Steegmuller, A Woman, A Man, and Two Kingdoms: The Story of Madame d'Épinay and the Abbé Galiani, 1991:66f.